In art, there are contextual “trends” and then other trends that persist before rising to the level of “practices”. We have therefore recently seen a growing number of artists who question social networks and at the same time see festivals and digital art events offering an ever-greater place to practices resulting in the use of sound. 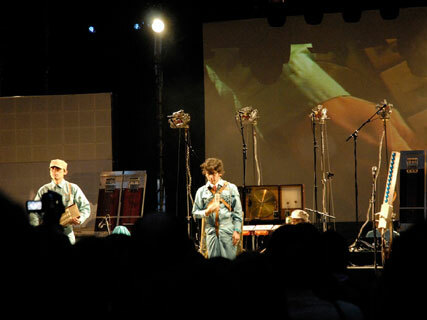 Futuresonic in Manchester, like City Sonics in Mons, are among those festivals whose names inform us that they are focussed around sound creations. Drew Hemment, the founder and artistic director of the Futuresonic festival, has brought together a considerable number of audiovisual performances and concerts once again this year. But he has not resisted the flood that pushes the organisers of such events to question social networks via installations and workshops. The German artist Aram Barthol has set up at the Cube in Manchester to animate his Workshop entitled “Friends”. His proposal involves creating a collective book with the public along with personal notebooks directly inspired by the online services of Facebook. But he warns the festival goers who want to sign up that the operation takes a little longer than the simple registration on a social network server as he only authorises the use of “Low Tech” tools such as paper, scissors, stamps, ink… People can become “friends” when they have finished their creations and they have received a few stamps. This workshop incites us to reconsider the notion of friendship in the era of the Web 2.0. Who in fact hasn’t heard of someone claiming to have thousands of friends online? A colleague recently confided in me his reticence in responding favourably to his son’s invitation to be his friend on Facebook! 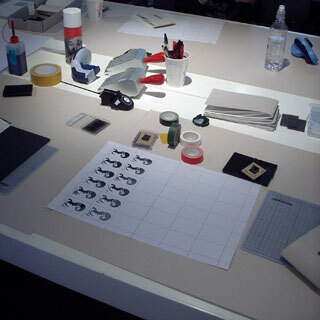 Those who would like to know more about Aram Barthol’s workshop can look at the photos posted on Flickr. plan b, “myspace - ourspace - yourspace”, 2008. Let’s walk through Piccadilly Gardens now to go to the Cafe Pop where the German artists of the plan b collective have set themselves up for the duration of another workshop where I found myself pleasantly trapped. This workshop entitled “myspace - ourspace - yourspace” once again makes reference to an online service, that of Myspace. It was only after filling in a form about myself that I finally realised my personal space in assembling a few objects and images inside the A5 format shoebox they offered me. As for knowing what was going on inside my head when I decided to place a tiger on the artificial grass that I’d glued on before that, with real glue…and from there to redefining the notion of space itself in the era of the Web 2.0, is another story…and my neighbour at the table confiding to me while he too was building his personal space: “Doesn’t this spell the end of digital art?”. We now leave Manchester to go to the gates of Paris, to Saint Ouen, where the main exhibition of Mal au Pixel, the French version of the Finnish festival, Pixelache is held. Mathieu Marguerin, the artistic director of this third edition has confided the entrance to the Manpower exhibition room to the members of the French collective Scenocosme. They have installed plants of seemingly normal appearance for a work called “Akousmaflore”, but which are rather special. Appearing to be suspended in space, their long stems descend to the height of our heads and so people touch them, if only to check that they are real. And it is then that we hear sounds, musical notes perhaps. This ensemble of caressed leaf instruments can apparently be played by several people at once. 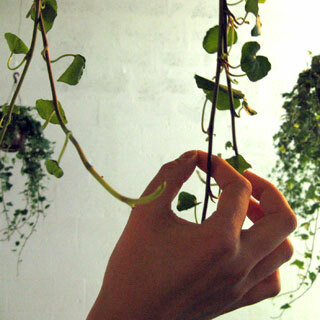 The gestures of the spectator’s make them performers because they participate in a form of choreography focussed on invisible forces that inhabit the plants and that they transmit in total coherence with the music that is being played, without controlling it, since they are, in their “natural” state, the most complex of sensors. Also in the Paris suburbs, in Evry, Nicolas Rosette invites us on a meander through the Agora Theatre. Here too this second “Eclectic Circuit” of the season is focussed on the invisible because it hangs together around the theme of “vibrations in the air”. 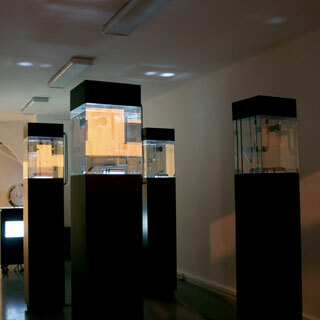 It is on the ground floor that four aquariums from a concept called “EOD02”, conceived by the Belgian artist Frederik de Wilde in collaboration with members of the LAb[au] collective based in Brussels, have been set. We learn that the fish in the aquariums are blind and that they emit electronic signals to both perceive their environment and communicate with each other. These same signals, in the form of waves or pulses, are manipulated digitally and so have an impact on the light and sound environments of the installation. Vibrations, waves and clicks: everything that is perceived here is placed somewhere between communication and language and only has the living as its source. 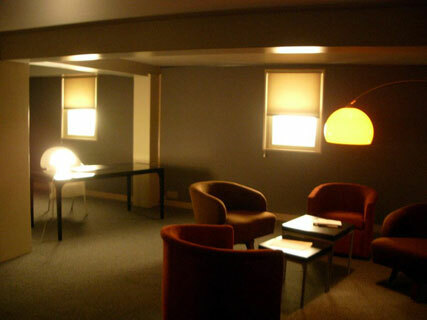 It is again a question of listening to the invisible at La Suite in the Maison Rouge in Paris where a dozen artists have taken over under the commission of Jean-Philippe Roux, the coordinator of the Pure Presence collective, who defines his exhibition “Hearing Ghosts”, thus: “An unoccupied hotel room where the furniture is subject to sonorous expressions”. I have never seen so many people trying to track sounds that seem to come from the beyond. Someone has their ear to a table, another is scrutinising a console, all of them immobile, or practically, in a zone that is located somewhere between waiting and listening. Inside each piece of furniture, vibrations are emitted that are only delivered when approached. I thought I heard a bell ring, without any idea of where the sound was coming from. I even discovered a few sounds coming from one of the four pillars of this mysterious hotel room, which for whatever reason, were not featured on any program. Do they involve real ghosts or more likely, the thrum of the city’s underground when a metro train goes by? Coming out of this exhibition, my hearing had become more acute, before once again yielding to the dominant sense of sight. Making instruments is decidedly no longer the exclusive domain of specialists. This was also the case at the Parisian festival devoted to the new “instrument inventors”, called Octopus, and its fifth edition was held between the Point Ephémère and the Maison des Métallos. So what was my surprise when an animator offered me a pair of ear plugs to better “perceive the music” composed by Lynn Pook and Julien Clauss, after comfortably settling myself into one of the four hammocks in their installation called “Pause”. 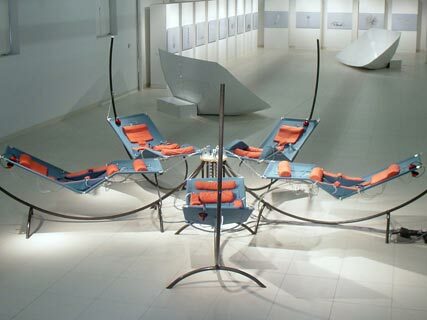 These hammocks are equipped with speakers without membranes that transmit vibrations through contact to various points in the body. So it is through our resonating bodies that the music circulates. And with respect to the spacialisation of sound, it is internal; or rather our entire bodies are simply the conduit for what we are hearing. Artists collaborating with each other is not uncommon. For example, the “audio tactile” system used by Wolf Ka in “Moving by Numbers” has been developed by Lynn Pook and Julien Clauss. 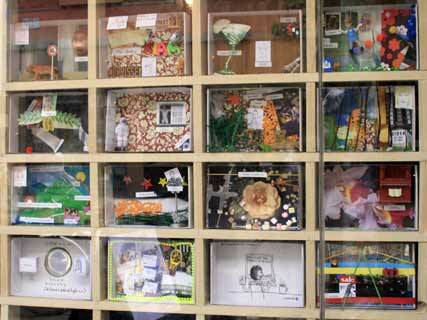 This installation was among twenty or so works selected by Carine Le Malet, the artistic director of the third Cube Festival, exhibited in the city of Issy-les-Moulineaux. The spectator is separated from the dancer in front of them by a one-way mirror within a kind of “Black Box”. 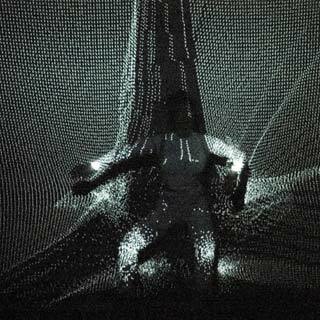 The dancer, because she is entirely covered in white, is an integral part of the image that is projected. But she is also wearing several dots of light that allow her movements to be captured and thereby control the particles that are being projected. Every gesture she makes is inextricably linked to the image that literally dresses and covers her. The dancer is thus one with the image while the spectator becomes one with the sound. Two intimate relationships are then set up and cohabitate for the duration of this installation/performance. “Nox Borealis” is also among those pieces whose form is situated between installation and performance as it was presented as an installation at the Finnish Institute and given as a performance at the Agora Festival of the Ircam. Members of the public at the Finnish Institute were encouraged to stretch out on enormous pouffes scattered about the floor while a wide screen, attached to the ceiling, was tilted towards the floor. The spectators thus found themselves in the position of those who enjoy looking at the stars. The music, composed by Kaija Saariaho, literally becomes one with the visual universe developed by Jean-Baptiste Barrière. 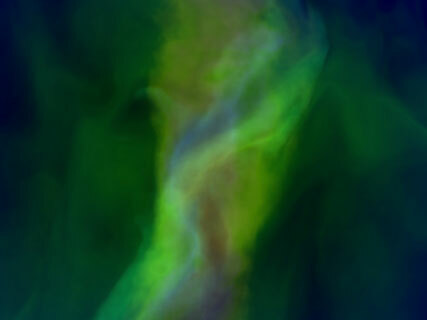 In order to produce this piece, the two artists took inspiration from the aurora borealis they observed above the North Pole. There are coloured and translucid filaments in the image that are endlessly tangled up with each other to form, at times, representations that our minds interpret according to our emotional state at the time. These same filaments, that form divine hairstyles or celestial drapes, are truly sensitive to each note of music, to the point where they seem to be coming from the same energy. And indeed the piece is about energy through these coloured and translucid representations. 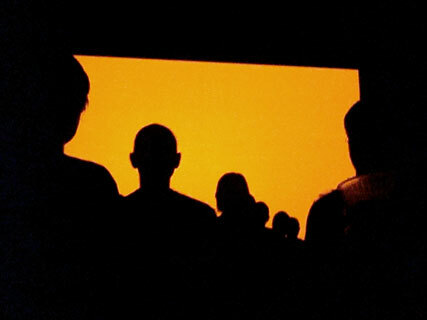 There are numerous audiovisual performances following the example of “PV868” conceived by the Italian artist Tez, that can only be seen within the context of festivals devoted to the digital arts and new media. So it was at The Cube in Issy-les-Moulineaux that Gilles Alvarez, the artistic director of the Nemo Festival, suggested that Tez give his performance, a few months after its presentation in Amsterdam during Sonic Acts. There is a warning given at the entrance: no epileptics! The artist stands in the middle of the crowd, to better control the “PV868” in real time. The least that may be said for his formal vocabulary is that it is uncluttered as only a few lines and other colour gradients intervene to disturb the flat surfaces of bright colours. The screen, when it is entirely hollowed out by a single coloured light, reminds us of the saturated spaces of James Turrell. And the only reference points are the outlines of our neighbours in front that the stroboscopic lights occasionally divide in two. One thinks ultimately of Paul Sharits and his flicker films. Tez does not conceal his objective either, which is to address our brains rather than our minds by intervening with a rhythm of projected images as with the rhythm of sounds being diffused. As for the audience, which remains impassive during this rather extreme sensorial experience, it seems to have tipped into an almost hypnotic state, if it’s not into a conditioning phase. Everything on the place Verdun of Enghien-les-Bains on this June evening would suggest that we are waiting for a concert to begin. Microphones have been placed on a stage framed by its projector laden metallic structure. But the event is nevertheless rather exceptional as Dominique Roland, the director of the Arts Centre and initiator of this third “Bains Numériques” has programmed a Japanese collective bearing the name of a company that was founded in 1979: Maywa Denki. Starting things off, there is a film credit using the visual codes of the world of business. The members of the group, all in blue uniforms, then come on stage. Nobumichi Tosa, who calls himself “President”, presents a few musical instruments. A few spectators are at this point still waiting for the concert to begin, which in fact has already started and which follows the rhythm of the presentation of products of the Maywa Denki Company. The Koi-Beat is a kind of rhythm box that is held like a sort of guitar while the Pachi-Moku is another percussive instrument made of two wings that are deployed on the musician’s back. All these objects made of the most diverse materials and of the strangest forms, are electric. And then there is the celebrated Bitman, conceived in collaboration with Ryota Kuwakubo, another Japanese artist. It has the shape and size of a Tamagotchi and encloses a small character that dances when it’s shaken. And the “President” reminds us that the Bitman is among the Maywa Denki brand’s spin-off products that will be on sale at the end of the presentation!…marketing is raised to the ranks of an artistic practice. Lastly, like every year since 2003, Philippe Franck, the artistic director of the City Sonics festival, is proposing a sonic wander through the city of Mons, in Belgium. There are two “artistic circuits” produced by the French artists Cléa Coudsi and Eric Herbin at the beginning of the route, this year in the Saint Georges room. 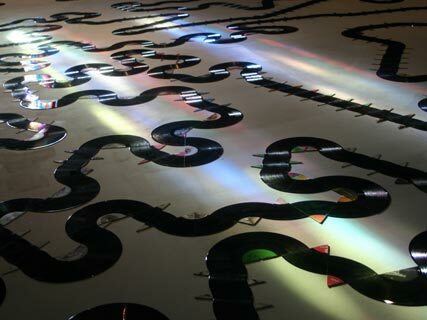 They have cut and then reassembled a few hundred vinyl records to create two tracks that two model trucks equipped with needles called “Vinyl Killers”, can run over. The records, coming from the personal collections of the two artists, have been cut in portions ranging from half to a twelfth of the record, so it is rare that one can recognise a melody. As for the title of this installation, “Other Side Break”, it is a reference to the “DJ Scratch” culture of the two artists. Everything here participates in the principle of non-determination that was so dear to John Cage, since it is difficult to imagine that the two model trucks could follow the same grooves, knowing that their speed also depends on the ambient luminosity. So the “sound cut up” that is being played while we listen is nothing other than the translation, through sound, of these two object’s (that look like children’s toys) movements in space and time. Is not randomness one of the essential components of what today we call Sound Art?